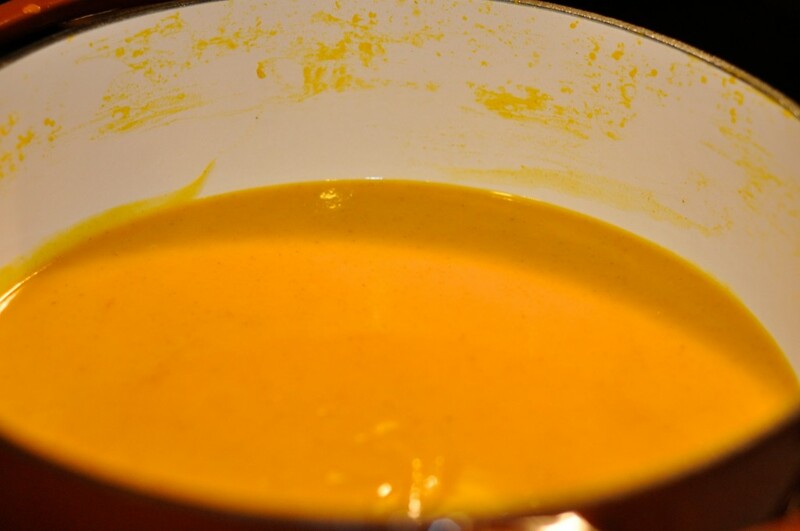 Sometimes its really nice when we get a cold snap… recently it has meant that I cook soups.. lots of them.. Tonight I cooked Butternut squash soup. As per usual I found a recipe I kind of liked and then “fixed” it. Well this time I “fixed” it so much I completely changed it from its original version that I am simply going to call this my own! Melt butter, add onions, saute until soft. Add squash and 2 cans of broth; just enough to cover the squash. 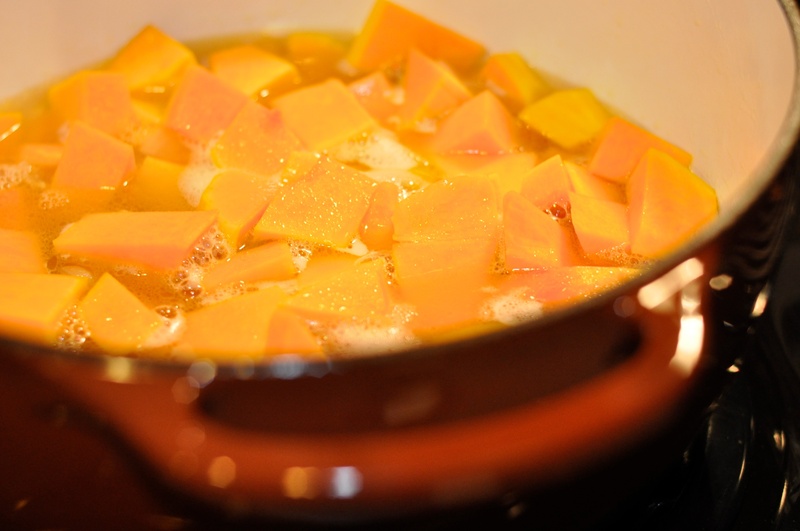 Let simmer for about 20 minutes or until squash is tender – use a fork to test. Use your judgement with the rest of stock, add a half a can at a time while you use an immersion blender to puree everything. I like my soup fairly thick but you will need to add a bit more to blend. Once you have the consistency right add the cinnamon and nutmeg and warm throughout again. Serve. It was really nice to have the creamy consistency without having to add heavy cream! I really wanted Mexican food tonight. I wanted to go out and eat bad for me food. Common sense and to an extent, laziness, got the better of me. This is why I ended up making this tonight. Something else I want to start doing is blogging about the healthiness of the ingredients in some of my meals. I am not on a diet so much as I am on “I need a beach body” eating plan. As far as I can tell the ratio is about 70% diet and 30% exercise, at least for me. I am going to the gym and I am concentrating a lot on what I eat and how much I eat. I am not starving myself at all, I am simply making smarter food choices. This started a while back with my move to eating some organic fruits and veggies as well as starting to prepare food at home rather than relying on eating out or canned/packaged food. Broth - I used Swansons fat free chicken broth. Butternut Squash – Low in fat, butternut squash delivers an ample dose of dietary fiber. It provides significant amounts of potassium, important for bone health, and vitamin B6, essential for the proper functioning of both the nervous and immune systems. The folate content adds yet another boost to its heart-healthy reputation and helps guard against brain and spinal-cord-related birth defects such as spina bifida. Cinnamon – Can regulate blood sugar, it can reduce LDL cholesterol levels. It has natural anti-infectious compounds. It contains small amounts of fiber, calcium, iron, and manganese. t’s been proven effective for menstrual pain and infertility. Nutmeg- Nutmeg has strong antibacterial properties. It is effective in killing a number of cavity-causing bacteria in the mouth. Nutmeg can help to combat asthma and It is also used to relax muscles. Onions – Early American settlers used wild onions to treat colds, coughs, and asthma, and to repel insects. In Chinese medicine, onions have been used to treat angina, coughs, bacterial infections, and breathing problems. Onions contain a number of sulfides similar to those found in garlic which may lower blood lipids and blood pressure. Onions are a rich source of flavonoids, substances known to provide protection against cardiovascular disease. Onions are also natural anticlotting agents. Onion extracts, rich in a variety of sulfides, provide some protection against tumor growth. Oh and butter – its real, and its good. In moderation except at Christmas, Thanksgiving and my birthday!